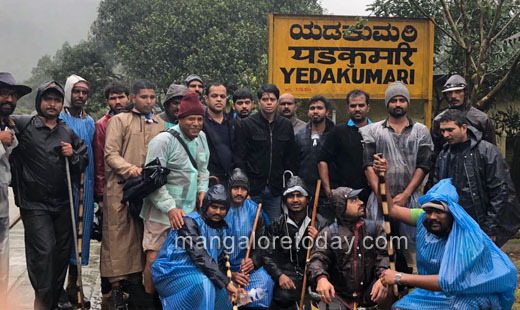 Mangaluru, Aug 17, 2018: District administration is all set to airlift 16 railway staff from Yedakumari Railway station near Sakleshpur. Helicopters are being brought from Bengaluru. The Fire and Emergency Services personnel will take up the rescue operation. A K Sinha, Additional Divisional Railway Manager, (Mysuru division), SWR, has requested Hassan deputy commissioner Rohini Sinduri for the airlift operation. Due to heavy rains and landslide, Yedakumari station is in dangerous condition. The staff are unable to move out in either direction. Landslides have occurred up to 50 to 100 metres on either side of the station. Heavy boulders have slipped in front of the station leaving the staff in anxiety, Sinha told Sinduri in a communication. Meanwhile, an SWR’s team is struggling to restore 55 kilometre railway line between Sakleshpur railway station in Hassan district and Subramanya in Dakshina Kannada district. Heavy rains and landslide have severely affected the line. It may require at least one week for them to restore the line. According to Aparna Garg, Divisional Railway Manager (Mysuru division), several trees and boulders have collapsed on the track. Around 32,156 cubic meter of soil has deposited on the track. As many as 42 land slides, including 10 episodes on Thursday have been reported in last three days. “The department is monitoring the situation and 10 earth movers, 180 labourers, 45 supporting staff and 10 officials are involved in clearing the track. It may need seven days to clear the tracks,” she added. Yedakumeri railway station near Sakleshpur railway station has recorded 9,516 mm rainfall almost three times higher than the previous year.